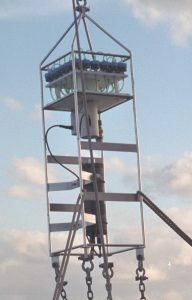 The McLane PPS Phytoplankton Sampler is a self-contained unit that collects up to 24 particle samples from the water onto 47mm filters membrane filters. The samples are collected in a user-defined time series and can be analyzed for trace metals, phytoplankton and suspended particles. The patented multi-port valve isolates individual samples and distributes water directly to the sample filter so that it is not contaminated by passing through a pump. An in-line filtered water flush port also protects the pump from large particle interference. countdown delay. The total volume pumped over the filter, the flow rate, and sample collection time can all be user defined. The sampling date is recorded and includes timing, flow, and electrical parameters. The hardware and software can be customized to suit customers requirements, such as adding optional extraction columns and fixative reservoirs. An optional external power connection is also available. The McLane PPS may be deployed on an in-line mooring, on a bottom lander, or a ship wire.